The Scout enters the 2013-2014 All Mountain/Big Mountain class as essentially a metal-free version of Blizzard's award-winning Cochise. If the prospect of a lighter, more touring-friendly Cochise fills your heart with glee, you're not alone. The Cochise remains a formidable ski—one that has clearly altered consumer expectations and ski design standards across the industry. What does the Scout feel like? Not surprisingly, it feels a lot like the Cochise. If there is news here, it is just how similar the two skis actually are. We expect the loss of the Cochise's metal dampening/stiffening layer to translate in the Scout as reduced edge grip and more vibration overall, but on-snow I found the difference to be very, very minor. In fact, I'd speculate that at ski waist sizes in this range—108 millimeters underfoot—the advantages of metal may well be largely illusory but for the heaviest riders. One Blizzard tech told me he thought the Scout rode at "90-95%" of the Cochise's performance level. For me, the ski had almost exactly the same outstanding hard snow edge grip, and exactly the same big GS feel. The Scout, like the Cochise, likes to go fast and is very comfortable doing so. I wouldn't hestitate to recommend it as a full-bore, lighter alternative to the Cochise, even in-bounds. You can expect powder performance to be similarly excellent, especially in wide-open terrain. If there is a weakness to the Cochise, it is the ski's resistance to tight and quick turns, which is especially evident in moguls and tight spaces. Unfortunately the Scout, while lighter, doesn't pick up that much more liveliness: both models prefer long-radius turns. Subjectively, the Scout has all of the Cochise's magic, adding up to a heck of a lot of skier delight in a wide range of conditions. If you've been thinking about putting touring bindings on a Cochise, there's no reason not to jump on the Scout instead. And even for resort skiing, the Scout may well prove to be the better choice for the majority of skiers. 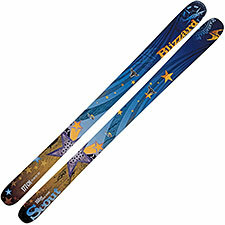 Another great ski from Blizzard.